IPhone users always wanted that type of cases that will protect their phone plus their iPhone also not lost its style and uniqueness. If you are the one among them then your desire is guaranteed because you have come at the right place because SPIGEN iPhone 5 Case Slim Armor has arrived.SPIGEN SGP slim armor case has been designed to keep that thought in mind it not only protect your phone but gives it the same style as the iPhone has with more colors as it comes in three choices of colors namely Metal slate , Gunmetal and Satin silver. 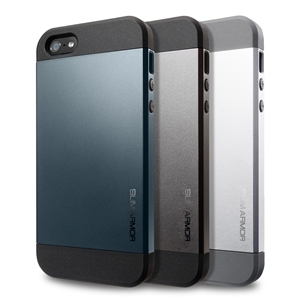 This case has a TPU which features an advanced shock absorber on top bottom and from corners. The case fits in perfectly with the iPhone and especially the speaker opening is designed in that way users will not lose any of the sound quality of their iPhone. Case has a metallic finish with a hard plastic body; you will find two tons of color in the slim armor case which resembles with iPhone black color.